The FP7103 is a PWM control buck converter designed to provide a simple, high efficiency solution for driving high power LEDs. With a 0.25V reference voltage feedback control to minimize power dissipation, an external resistor sets the current as needed for driving various types of LEDs. The FP7103 includes a high current P-MOSFET to realize high efficiency and excellent transient characteristics. 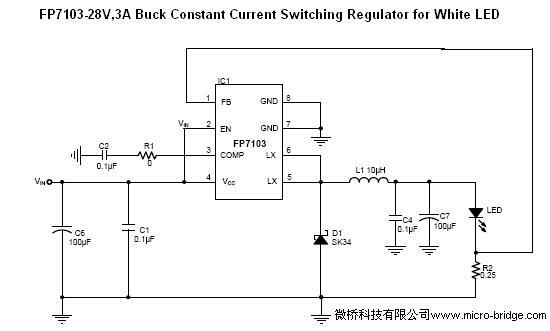 The PWM control circuit is able to change the duty ratio linearly from 0 up to 100%. Other features include user accessible EN/DIM pin for enabling and PWM dimming of LEDs, thermal shutdown, cycle-by cycle current limit and over current protection.